Library hours, who can use the library, what you can do in the library and more. COM Library is located in the Learning Resources Center. Our mission is to provide access to and delivery of college level sources and library instruction to students, faculty, and staff in support of the research and instructional mission of the College of the Mainland (COM). Scholarly articles on Edgar Allen Poe in Gale PowerSearch. Books and eBooks on media bias in OneSearch. HBO documentaries in Films on Demand. Primary Source Documents on the American Revolution in Salem Online. See more about all our collections. We have a library lab with printers, lots of computers, Office, access to all our databases and staff to help you when you need it. There are study rooms and lots of places to read, study, charge your devices, and even places to de-stress with puzzles, chess, and backgammon. 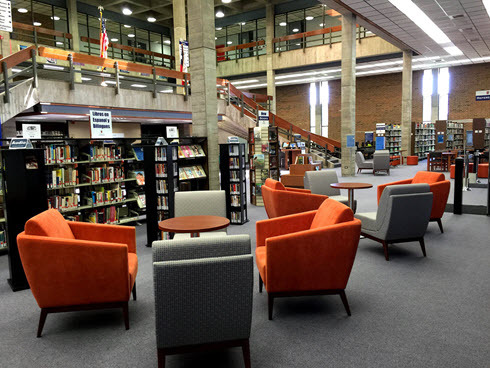 See more about library spaces. Available 24/7 on or off campus, our guides are great one stop resources designed by COM Librarians with our students in mind, to help you find the best resources for your projects and save you time. It's true, you can access most COM Library resources at home, Online 24/7. Our guides and Ask COM Library are available 24/7 on or off campus. Our databases can all be accessed off campus from our database page. Just login with your COM ID# and last name. You can ask us for help when we are open by live chatting from all our guides and Ask COM Library pages. Hoopla streaming video (movies and TV shows), music, audiobooks, eBooks and comics for your device.